Bus driving positions available now! Are you semi-retired or returning mum/dad looking for a part-time position to ease back into the work force? Are you interested in driving professionally and meeting people? Do you want a stable career with a progressive company? 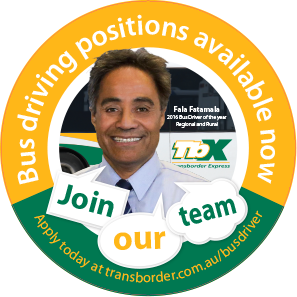 Transborder is presently seeking to increase its driving team. A typical part-time shift includes 3 hours morning and afternoon, 5 days a week. In between you can sit back and relax and socialise with fellow drivers in the depot, or enjoy some retail therapy in the Queanbeyan CBD. After you settle in with us, if you enjoy your job, there will be an opportunity to increase the amount of driving hours you work. Attend a training program, which includes licence upgrade and Driver Authority training. Have held a full Australian Car licence or a Light, Medium or Heavy Rigid Vehicle Licence for 12 months or longer. Have an excellent driving record. Be able to pass a Medical, Police check and Working with Children check. Transborder holds accreditation with the NSW and ACT Governments. Accreditation ensures that bus and coach operators adhere to strict policies in relation to vehicle maintenance, safety management, drug & alcohol policy, service provision and driver training.